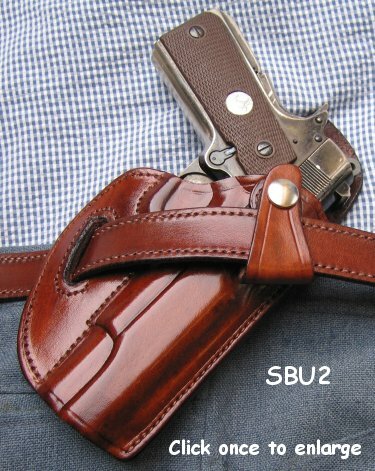 In keeping with Horseshoe small of back holsters, the SBU2 has all the outstanding features and advantages of the SOB2. However, it is designed to be worn under the belt for added concealment. A belt slot and a loop fitted with a one-way snap provide a high degree of stability. The rear protective tab is standard with this model. Check the availability of the SBU2 for your weapon by consulting the Holster Selector Chart. Available for belt widths of 1 1/4" or 1 1/2" only in Saddle Tan, Cordovan, or Black (Click here for colour samples).